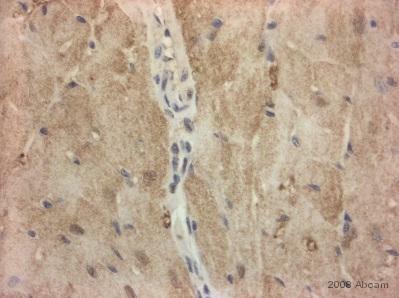 ab45966 reacts with H-FABP, but does not react with liver or intestinal forms of this protein. Synthetic peptide corresponding to Human H-FABP aa 100 to the C-terminus (C terminal) conjugated to keyhole limpet haemocyanin. Recombinant Human H-FABP protein (ab84335) can be used as a positive control in WB. 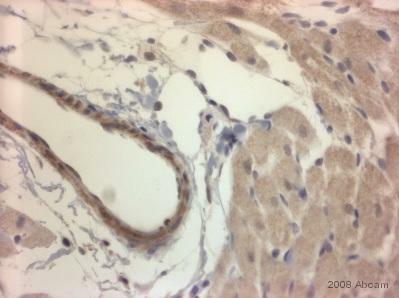 ab45966 gives a positive result in the following tissue lysates: Heart (Human) Tissue Lysate, Skeletal Muscle (Human) Tissue Lysate. Our Abpromise guarantee covers the use of ab45966 in the following tested applications. WB Use a concentration of 1 µg/ml. Detects a band of approximately 15 kDa (predicted molecular weight: 15 kDa). Belongs to the calycin superfamily. Fatty-acid binding protein (FABP) family. Forms a beta-barrel structure that accommodates the hydrophobic ligand in its interior. Ab45966 does not cross-react with small intestine or liver FABP. 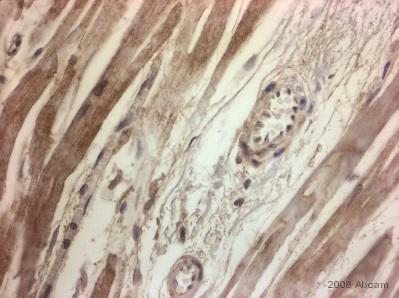 ab45966, at a 1/500 dilution, staining H-FABP in mouse heart by Immunohistochemistry, using formalin-fixed paraffin embedded tissue. Ab45966 recognizes the full length tagged recombinant protein (ab109160) which has an expected molecular weight of 16 kDa. Publishing research using ab45966? Please let us know so that we can cite the reference in this datasheet. 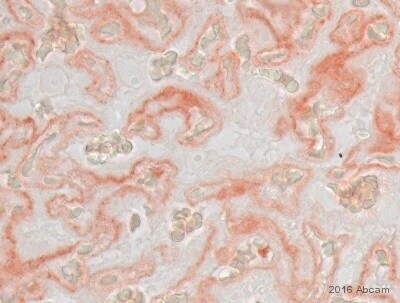 We have been testing this antibody from abcam. for detection of purified FABP3 and in cell samples. However when testing the sensitivity of the antibody we are unable to detect lower than 0.5ug of pure FABP3 protein in a 1:500 dilution of the antibody in 5% milk TBST. (see attached image. Amount of pure FABP3 protein from the left. 2,1,0.5,0.25,0.125,0.065 ug) This is major issue, because we would like to detect FABP3 from a total cellular proteins samples of approx. 15ug. 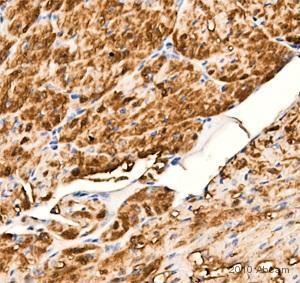 As FABP3 is at most present in 5% we will unable to detect with this antibody. Do you have any suggestion to improve the sensitivity of this antibody or do you have any antibodies with greater sensitivity which can detect in the lower ng range of pure FABP3? 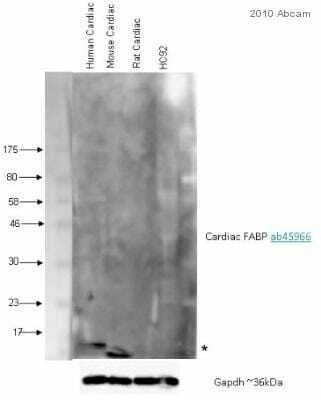 Thank you for contacting us and reporting the difficulties you have been experiencing in using the anti-Cardiac FABP antibody (ab45966). I would therefore advise using 5% BSA in your blocking (we use 5% BSA in 0.1% TBST for 1 hour at room temperature), as well as in your antibody diluent (again, we use 5% BSA in TBST). I would also suggest, if you are not already doing so, to incubate the primary antibody with the membrane overnight at 4°C as this can improve the strength and specificity of the signal. Please do let me know if these suggestions do not help to improve the results sufficiently for your experiments requiring the detection of the endogenous protein. If this is the case, I will look into if we have an antibody or lot which may be more sensitive. I look forward to hearing how you get on. Until then, I wish you all the best with your research. Testing discount code for ab28723 to test in z/finches. I am very pleased to hear you would like to accept our offer and test ab28723 in Zebrafinches. This code will give you 1 free PRIMARY ANTIBODY before the expiration date. To redeem this offer, please submit an Abreview for Zebrafinchesand include this code in the “Additional Comments” section so we know the Abreview is for this promotion. For more information on how to submit an Abreview, please visit the site: www.abcam.com/Abreviews.